Hadleigh's White Witch - how should we remember him? An office block stands on a narrow lane called Endway, just south of the church in Hadleigh. It has taken the place of a row of six old weatherboarded cottages, the second of which, coming from the church, used to be the home of James ‘Cunning’ Murrell, shoemaker. We don’t know if he was a good shoemaker, though his fame, which reached as far as London and Kent in his time, seems to be quite remarkable. Even today, people around the world are researching his background and connections and publishing them on websites. It was his sideline that spread his name, for he claimed to be the seventh son of a seventh son – a witch, but a white one and he had the angels on his side. He had been baptized at St Mary the Virgin, Hawkwell, on 9 October 1785. His place of birth was given as Rochford in the 1851 Census. That survey lists the widower James Murrills (then 66) as living with his son Edward (26), his daughter Eleanor (16), another daughter Louisa Spendale (20) and her son of six months William Spendle (!). Of James and Elizabeth Murrell’s children, 16 were counted in the parish registers of St James the Less – though it seems that more died in infancy. Murrell left this world in Hadleigh on 16th December 1860, and if his date of baptism is correct, which usually took place only days after a birth, he was 75 years old, having foretold his own death to the day and the hour. 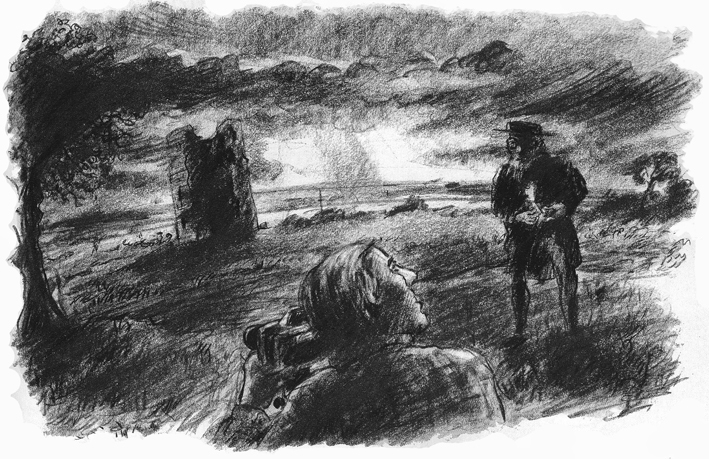 Around 1890, when the writer Arthur Morrison visited the cottage and met the new tenants who were in their nineties, they still believed in and praised the remarkable wizard, who had lived there before them. They talked of the cures he had performed, the amazing recovery of stolen goods, his prophecies aided by the stars and his triumphs over the designs of witches. The front door of the cottage opened into the little room where he had received his clients ‘amid walls hung about thick with the herbs that he was always gathering,’ though there are also reports of stashed contraband in that cottage. 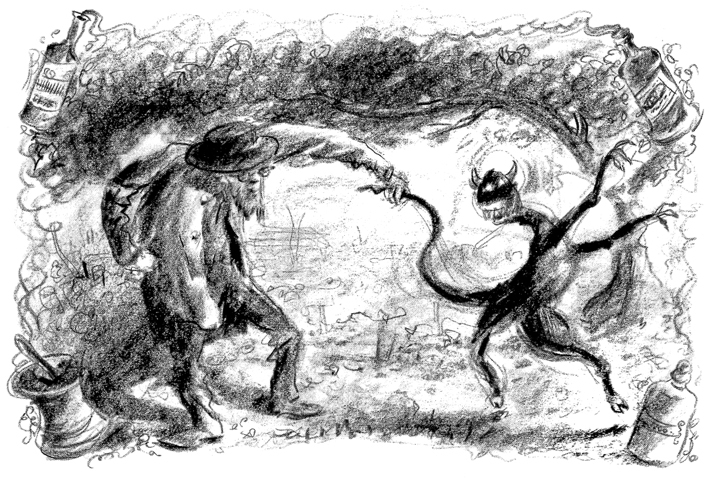 Morrison borrowed a trap from Mr. Cracknell, the landlord of the Castle Inn at the time. They drove over to Thundersley, where they found Murrell’s son, Edward ‘Buck’ Murrell, working in a field – an illiterate, stocky, white-haired labourer, who soon became the centre of attention and a mine of anecdotes about his mystic father at the promise and deliverance of a pint of mild. Murrell’s landlord had buried the little old man’s chest and other possessions in the back garden, but Buck had recovered them and they opened that promising chest in the parlour of the Castle Inn. On Buck’s father’s death a sack full of letters had been destroyed, yet there were still many left in the wooden chest among other scraps of paper covered in ‘crabby’ writing amid calculations, horoscopes, exorcisms and conjurations and obscure ancient books on Arthur Morrison’s visit. Among books on astrology and astronomy, old medical books, a bible and a prayer book were home-made books and manuscripts. Some of these dealt with conjurations and magic, astrology and horoscopes. Yet for all his fame he had remained poor. Even when Morrison was shown his grave and those of his family around him by his son Edward ‘Buck’ Murrell at the east side of Hadleigh church, the graves were unmarked. And even then most were just a discolouration in the turf. Mysteriously, Morrison recalls, he lay at rest there with twenty of his children about him! Another amazing feat of the ‘Cunning’ magician and conjurer? Arthur Morrison published both a novel and a ‘Strand’ magazine article on ‘Cunning’ Murrell in 1900. The idea was first suggested by a neighbour and has been welcomed by some, if not all of those I have spoken to since. Hadleigh’s former resident James Murrell (1780-1860), colourful hero of print and fiction as well as many folk memories, has no local recognition. We don’t acknowledge him anywhere in Hadleigh apart from his inclusion in the relief on the Library wall, not even with a blue plaque on the site of his former abode. There is, however, a path roughly connecting Castle Lane and Chapel Lane just north in the Salvation Army complex that is known as Fitzwilliam Road or more colloquially as Piggery Lane. (Who is or was Fitzwilliam?) It’s not much of a road, but it takes in great views, is a bit devious and slippery and could have been part of the little man’s herb gathering walks? It’s a small, local idea, but it would add a little zest in an about to be much publicised area, so close to the Olympic site. While I would welcome a commemoration of the little man out in nature, others are not too happy with renaming ‘Piggery Lane’. Naming one of the newly planned commercial ‘lanes’ as part of the council’s regeneration plans in the town centre have been suggested as possible memorials, or even a statue in the middle of Hadleigh? Something more prominent than a country lane? Another suggestion is an annual Cunning Murrell award at a local school to provide ‘a maintenance-free, vandal-proof memorial’. Perhaps on a history subject? Or on traditional medicine? Or on folklore? So, how about David’s idea for a CUNNING MURRELL LANE or PATH? Others may have different ideas still. Perhaps it can be discussed and a local accord arrived at? Illustrations by an unknown artist from my 2009 book 'Essex Ghost Stories'. The drawings were first published with one of the stories in Essex Countryside (now Essex Life) magazine some years ago, and include quotations from the wizard's own writings. Here 'Cunning' Murrell meets the author...? 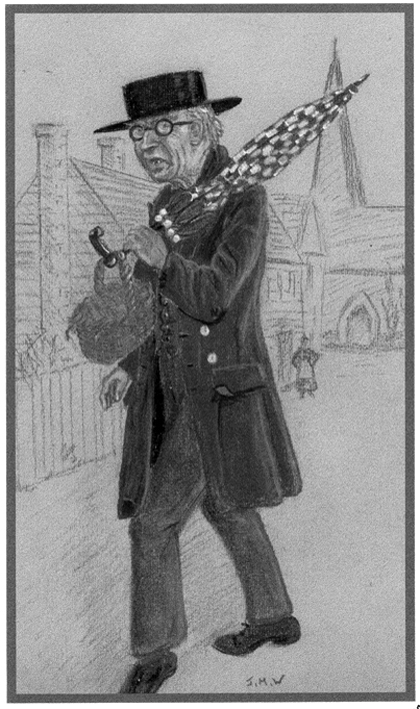 An illustration by Jean Westell based on descriptions of James Murrell. I have found a statement on the Web that “…James Murrell married ELIZABETH FRANCES BUTTON on 12 August 1812 in St. Olave church, Bermondsey, Southwark.” I have not found anything yet to confirm that this person is the Hadleigh James Murrell. Can anybody help? I believe my wife was a descendant through his daughter, Eleanor. My husband’s grandmother, her father was a son of Cunning Murrell. He’s been to see his wooden chest in Southend’s Museum, do you know of this side of his family Marie? Hi, I am a descendant of this remarkable man. I have been doing my family tree and us Murrells go as far back as 1066 in the battle of Hastings. Murrells have been living in Essex and the East End for centuries. I still have a great aunt in Kent. My grandfather who was named Peter Murrell passed a couple of years ago but remained in the East End till his dying breath. I’d like to know Mitzi, how James Murrell is your ancestor as I pretty much know of all descendants and you’re not mentioned. We have relations in America, Australia but your name has never cropped up. I am a bit surprised with all the knowledge about Cunning Murrell. My family have been in Hadleigh since 1880. Long enough to have gained some knowledge of the man. I always understood that he was a native of Canewdon and moved to Hadleigh. I also understood that he lived in a cottage in the High Street that backed on to the graveyard and his biggest claim to fame is simply this. He could probably read and made a periscope and concealed it about the front window and when he had visitors he could surprise his guests with all that was going on outside. Nothing too remarkable there. For all the other comments it may be entertaining but that is really all it is. It’s great to see James Murrell remembered; he was in his day the affordable locum of all crafts and was available to all who knocked on his Endway cottage door. He has largely been ignored by History but my research has revealed a humble, knowledgeable man more than willing to enhance his reputation at the cost of being poor. Many times Murrell helped local farmers and those in need of aid and got little in return. He died a poor man…I so wish I had known him. Do not remember James Cunning Murrell being mentioned during my youth in the 1920-30s but remember the cottages in Endway well and seeing elderly occupants sitting outside them. The Olympic Mountain Bike organisers are seeking names for parts of the course. I have suggested Cunning Corner & possibly Murrell’s Mount for the highest point. Television presenters seek useful fillers & the story behind the names could help get wider media coverage for Hadleigh’s most newsworthy man.